This is the circuit diagram of a moderate power FM transmitter circuit employing two transistors.The voice signals picked by the microphone will be amplified by the transistor Q1.The second transistor is wired as an oscillator operating in the FM band.The output of T1 is given to the base of T2.T2 performs the modulation also.The tank circuit comprising of components L1 and C6 determines the frequency of the signal, and can be varied by adjusting C6.The capacitor C7 couples the FM signal to the antenna. You can assemble the circuit on a general purpose PCB. The circuit can be powered from a9V PP3 battery. The Antenna A1 can be a 1M long wire. The inductor L1 can be made by making 6 turns of 0.8mm enameled copper wire on a 5.5mm diameter/4.5mm length plastic former. With a matching antenna and proper tuning this transmitter can have range upto 100meters. What is the operating frequency of this project? hello sir….this project is not work and i cant find any fault so plzzzzzzzz help me…. i made this circuit on breadboard but it is not tuned plz anyone can help me? Hi Amit It has to be ceramic or it can be solid tantalum bead type. not wound tubular capacitors, which has inductive component also buit in. What type of crystal oscillator can I use to replace the tank circuit with? Pls I need a reply with the frequency. hi. if I use mp3 player out put for this circuit (change Mic with audio in) what I do? can I connect player out to c1 directly? Remove R1 and C1 and feed direct to C2 and common. Adjust MP3 volume for clear sound from the FM monitoring receiver. hi,, can anybody tell me how can i tune it? Seetharaman, I want to add crystal to the circuit to make it stable.. Where will i connect the crystal. is c1 elctrolitic? cn I have c6 fixed? well that would mean the frequency to be fixed too right? Is 0.022j the same as 0.022pf. Hi Azeem 0.022J is 22nF (0.022uF) 250 volts capacitor. C7 should be 2.2pF. i’ve implemented the circuit. But i’m having problems with the frequency of transmission. It is probably the inductor that i didn’t get well. Please can you explain the oscillator stage of the circuit for me. Also is c7 and that 5pf part of the tank circuit? i got the frequency. However it does not transmit voice signals. If i tap the mic, i can hear it. Also At different frequencies by varying c6. But if i speak, i don’t hear it. If i play mp3, i don’t here it also. I used a condenser electret mic. Please help me. I’ve already submited the proposal for this project in school. I can’t drop it. Hi Azeem check polarity of capcitor C2 and try by reducing C4 to .002uF. (2k2 pf or 2200pF) it should solve the problem. In the notes the winding details of L1 is given you try it it should solve your problem. I am shameed baig. I want a FM transmitter ready made kit. and sir, how to choose alternate values for variable capacator n inductor?? please reply asap…..
i dont understand how will signal be amplified if R2=R3. Also, aint 0.022pF too low?? i am unable to see any oscillations on the collector of Q2. I have not connected microphone yet. 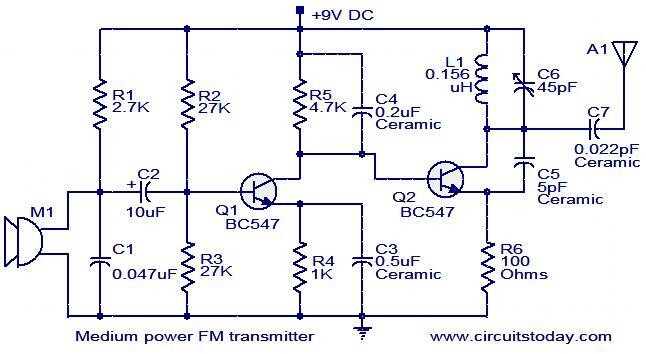 please can u describe that on which frequency this medium power FM transmitter circuit will be work.??? Please can you describe that on which frequency this medium power FM transmitter circuit will be work.?????????? i think all ground are connected.,correct?? but i confuse what is the voltage of ceramic cap. it is 50V?? and electrolytic cap is 16V?? Hi Ashnuka place order through net and get it or please drop the project, without ceramic capacitors it will not work. What are the replacements of the ceramic capacitors?I cannot find any of them. I understand everything of this diagram except capacitors. I don’t understand which volt of capacitor i’ll use….? Hello, I understand everything on the schematic except for “M1”. Can anyone tell me what component this represents? hi i am tired in adjusting inductor sometimes it work and sometimes it is out of work what to do? hi i tried to simulate the ckt in multisim 11 in the op i got voltage of nanovolt it s correct?????? I want to ask is the 0,022pF correct value? I can’t find any capacitor with that value available in Estonia. Hi Prudhvi you can use anything between 18 to 22SWG super enameled copper wire. Q1 is the mic amplifier and modulator. Q2 is the oscillator and power amplifier. complete discription about this circuit………..plz send me…..its urgent plzzzzzzzzzz………. can u give me the gaze value for 0.156uhenry inductor????? it is very urgent plzzzzzzzzzz………..
hey guys I construct the circuit but i want to now the frequency at the output to receive the signal!! Hi Techno girl it is a standard electret-condenser mic with 2pins and of 10mm dia. Please giv me the specifications of the the device M1 used in this ckt… I wnt it as early as possible. 1 nF is 0.000 000 001 Farads. Hi Pecanins any standard FM radio will receive the signal. Tune to a frequency where there is no broadcast signal, adjust capacitor C6 till you get the acoustic feed back through mic. now your transmitter is ready. will an ordinary FM radio recieve the signal from this circuit? thanks. with this i colpleted my project. how to calculate the value of of the component match by antenna ? Thanks a lot JOHN it’s worked very well with me. Hi writting in 3 digit is similar to color code. Brown black brown is 101 That is 10 X 10Â¹ 100PF, Brown-green-brown that is 15 X 10Â¹ 150PF, brown black orange 103, 10 X 10Â³ 10000PF or 10nF or 0.01ÂµF. First two digits are indicated in then the third digit is the mutiplier. You can represent only preferred E12 values in decade series 10, 12, 15, 18, 22, 27, 33, 39, 47, 56, 68, 82. 159PF is not possible in 3 digit system. Nice one, really worked for my science project. Thanks a lot. please, where should the negative terminal of the 9v dc be attached. Nice one, really worked for my project. Thanks a lot. plz send me more samples.